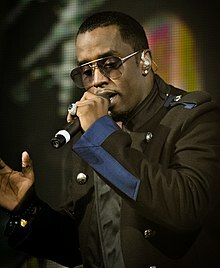 Sean John Combs (born November 4, 1969) is an American musician and actor. Combs has used many names during his career. He currently uses Diddy but has also used P Diddy and Puff Daddy. He was born in New York City. He started his musical career in 1988. He is in connection with Bad Boy Records. He is the richest hip hop musician. Combs has won three Grammy Awards. Three albums that he executive produced were put on Rolling Stone magazines list of the 500 Greatest Albums of All Time. In 2001 Combs acted in Made. In 2010 Combs released his fifth album, Last Train to Paris. Lots of other musicians sung on the album including Justin Timberlake, Usher, and Grace Jones. Combs has five children. He is also the stepfather of his girlfriend Kimberly Porter's son Quincy. ↑ Greenburg, Zack O'Malley. "The Forbes Five: Hip-Hop's Wealthiest Artists 2013". Forbes. ↑ "Oscars 2012: Sean 'Diddy' Combs Celebrates First Oscar For 'Undefeated'". The Huffington Post. HPMG News. February 27, 2012. Retrieved July 24, 2012. ↑ "2007 BET Awards→Nominations→Best Hip-Hop Artist". BET Interactive. Black Entertainment Television. Retrieved July 24, 2012. ↑ "40th Grammy Awards". Rock on the Net. 1998. Retrieved July 22, 2012. ↑ "42nd Grammy Awards". Rock on the Net. 2000. Retrieved May 23, 2012. ↑ "44th Grammy Awards". Rock on the Net. 2002. Retrieved May 23, 2012. ↑ "45th Grammy Awards". Rock on the Net. 2003. Retrieved May 23, 2012. ↑ "46th Grammy Awards". Rock on the Net. 2004. Retrieved May 23, 2012. ↑ "Ready to Die". Rolling Stone. Jann Wenner. November 1, 2003. Retrieved July 28, 2012. ↑ "My Life". Rolling Stone. Jann Wenner. November 1, 2003. Retrieved July 28, 2012. ↑ "Life After Death". Rolling Stone. Jann Wenner. November 1, 2003. Retrieved July 28, 2012.